Q & Q Control Services are very aware of the logistical and financial implications of off grade cargoes. Great emphasis is placed on the importance of ensuring compliance of product quality with contractual specifications, either through witnessing analysis at terminal laboratories or through analysis at our own laboratory facilities. All of our laboratories are managed by highly experienced personnel, who ensure the necessary levels of expertise and conduct continuity training in-house. 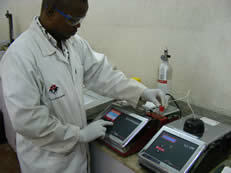 They ensure that systems and methods are adhered to, in order to provide accuracy, speed and consistency in our results. Witness of analysis is performed at the terminal laboratories by Chemist inspectors, who have experience gained from either a laboratory background or training provided at one of our own laboratories.